(23 mins) In this episode, Dr. Hackie Reitman speaks with Anita Lesko, BSN, RN, MS, CRNA. Anita is an internationally recognized autism advocate and member of Autism Society of America’s Panel of Autistic Advisors. She is also an author, with her most recent book being Temple Grandin: The Stories I Tell My Friends. 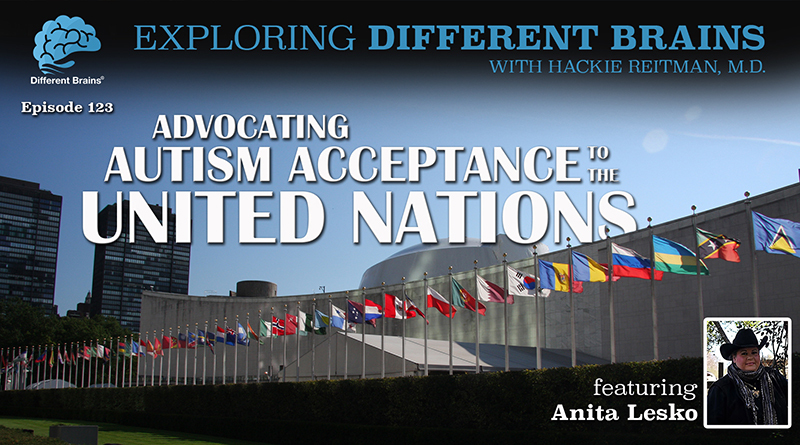 Anita discusses her own autism diagnosis at the age of 50, highlights the importance of following your dreams, and recounts her experience addressing the United Nations. Look for Temple Grandin: The Stories I Tell My Friends at Amazon, Future Horizons, or anywhere else books are sold. HACKIE REITMAN, M.D. (HR): Hi, I’m Dr. Hackie Reitman. Welcome to another episode of Exploring Different Brains. Today we are honored to have as our guest no less than Anita Lesko. She’s pretty amazing. She’s just coming out with a book about Temple Grandin: The Stories I Tell my Friends. She founded an organization and Anita herself is going to tell you how she was diagnosed with Asperger’s at age 50 and Anita, I’ll tell you what, you don’t even look like you’re 50 now. How did that happen? ANITA LESKO, BSN, RN, MS, CRNA (AL): Well, thanks for that compliment. I love that when I hear that. HR: Well, welcome to Exploring Different Brains. Why don’t you introduce yourself better than I did to our audience? AL: Hi, my name is Anita Lesko, and I’m 58 years old, I was diagnosed by chance when I was 50 with Asperger’s. I’d gone my whole life not knowing why am I so different, why do I not fit in anywhere, and had endless social problems throughout my whole entire life and obstacles to overcome and all kinds of sensory issues that I thought that I was the only person on the face of the Earth that had all this going on. And one night at work, I work as a certified registered nurse anesthetist, and I was at work and one of my coworkers had come in to the lounge at dinnertime and she was crying. And I’m like, “What’s the matter?” and she said, “My son just got diagnosed with Asperger’s,” so I looked at her and I said, “What is Asperger’s?” I had never even heard of it. Well, she handed me some papers and I started looking at them and the top papers said there was like a little test, and it said, “If you have 10 out of 12 of these symptoms, you have Asperger’s.” So as I read down the list, well I had 12 out of 12. And at that moment, I realized I have Asperger’s. And it was kind of like all the pieces of the puzzle of my whole entire life fell into place and suddenly made a picture. It was a very overwhelming moment to realize that your whole entire life just finally made sense in that moment. I went to the store that night on my way home from work and got every book about Asperger’s, read all of them. By the morning, I knew without a doubt I have it, and then I went for a formal diagnosis, to the same neuropsychologist that my friend had taken her son to, to get my formal diagnosis. It was just a formality. I already knew that I had it by that point. It was a very life changing event. It just totally gave me a whole new course in life. Since that time, right after I got diagnosed, I wrote a memoir called Asperger’s Syndrome: When Life Hands You Lemons, Make Lemonade because my whole life I was always making lemonade. But I became a very strong autism activist and I’m fighting very hard for many things for everyone on the autism spectrum. So it keeps me pretty busy. I continue doing my day job as a nurse anesthetist, doing anesthesia for surgery. I still work full time; I’ve been doing that for 30 years now. Last year for World Autism Awareness Day 2017 I spoke at the United Nations as a guest speaker. That was a very incredible, overwhelming, and honoring experience. My latest book that just came out as Dr. Reitman just said, it’s called Temple Grandin: The Stories I Tell My Friends. Well, I’ve known Temple since about 2011. That’s when I first met her. First on the phone, then I met her in person in 2013. We became friends after that. We’d talk periodically on the phone. Well, about a year ago, we were talking one day, and Temple has a really hilarious sense of humor, and she had said something and we both got into such a laughing jag, tears were running down my face, and I happened to be at work, and I had to get back to my cases, get going, and as I walked and we hung up on the conversation, as I walked back into the operating room, I thought to myself, “You know, I wish the rest of the world could see Temple the way I see her, because they see her as the scientist, the researcher, the autism advocate, activist, and all that, but they don’t see Temple the real person, with her sense of humor and all her emotions and everything. So that afternoon I called her and I said, “Hey, Temple, what would you think if I wrote a book about you?” Well, from there, it evolved, and over the next about 6 months, I interviewed her for over 60 hours. I’d sit at my kitchen table with my recorder on and we would just start talking. At first we just didn’t really have a pattern, we just kind of started talking about anything. One thing would always lead to another. We could start out talking about Temple collecting seashells on the beach when she was a child to going to Kennedy Space Center and watching a Space X launch and almost parking in Elon Musk’s parking spot. I mean the conversations would range from one extreme to another. It was very exciting; it was a personal journey for myself but it also brought out the true essence of Temple and people everywhere are going to be shocked; they’re going to be thrilled, amazed, and be laughing and crying and all that various things in between when they read this book, because it’s like Temple like you’ve never seen her before. HR: I can’t wait to read the book, I gotta tell you, because knowing her just a bit as I do, you know, being on the speaking tour with her and different things. She is one unique individual, as you know better than I. Why is it that it seems to me that women get the short end of the stick? They don’t get diagnosed until later. I know you were just on our Different Brains Spectrumly Speaking podcast recently with Becca Laurie, one of our board members who has Asperger’s, as well as Dr. Kate Cody, but speak a bit about particularly about women, your perception on this whole thing. AL: I think females tend to be a little more social to start off with. Now I know some people I hear, females on the spectrum who talk about that they try to pretend to be normal. Well, because I didn’t know I’m on the spectrum until I’m 50, I didn’t even know to try and pretend anything. I just was myself. I just think I was always the oddball, the weirdo, the eccentric person in the workplace and all that kind of thing. I didn’t know why. Nobody else knew why, either. I think that the whole issue is that females are a little bit more vocal, tend to be a little more nurturing, so I think that combined kind of brings out a little more social interaction than males. HR: Tell us how you got into your work as an anesthetist. AL: I think it actually kind of found me. I was in my third year working on my bachelor of science in nursing, and I used to be into ice dancing and I was doing a practice session with my ice dancing partner and we were doing some really fast footwork, trying to be all really fancy and we both kind of tripped ourselves and went flying on the ice, and I heard my left arm snap as I hit the ice and I felt this not a pretty feeling in my arm. So I look at my arm and I realize oh boy, I broke my radius and ulna. So I got up off of the ice and I kind of held my hand under the fracture. I kind of actually reduced the fracture myself because I kind of pushed it back up into place. I walk into the office at the ice arena and I said, “I need you to call an ambulance; I need to go to the emergency room,” and they’re like, “Why?” and I said, “Because I broke my arm,” and they said, “What do you mean you broke your arm?” so I let my hand go and my arm like dropped down and everybody was screaming. I thought it was pretty funny. I have a very high pain tolerance. That’s one of the characteristics, as I then learned, of people on the spectrum. So anyway, so I’m at the emergency room and we’re waiting for the orthopedic surgeon to show up and the anesthesiologist was already there and he’s talking to me. He says, you know, “What do you do?” and I said, “I’m a nursing student.” “Oh, ok, what do you want to do with your nursing degree?” and I said, “I don’t know, just graduate and start working as a nurse,” and he said, “Why don’t you go to be a nurse anesthetist?” so I’m looking at him like what’s that? I had never even heard of it, kind of like the Asperger thing, and he explained to me what it is, and so it struck my fancy a whole lot, sounded like very intriguing to put people to sleep and keep them asleep and everything. So I started researching that, by going to the library, back then there wasn’t like, you didn’t Google things online. So you had old-fashioned researching and making phone calls. So I had applied to Columbia University to their master degree program for that and I had gotten accepted, and as soon as, well, after I graduated with my bachelor of science in nursing, you had to have two years critical care experience as a nurse, plus two years of basically the same thing as premed courses, like organic chemistry and physics and all this thing. So I started getting those courses done, I worked full time as a nurse in an emergency trauma center while I was getting all those degrees, and then I started at Columbia University in 1986, graduated 1988, took my board exam, passed it, started working full time ever since. Now it’s 30 years. HR: Wow. Now, on your website, anitalesko.com, you comment how you are a medical professional on the autism spectrum. There’s a popular show on, The Good Doctor, and I just wanted to ask you your feelings about how those on the spectrum are depicted in the media and on TV and in movies and so forth. HR: As well as about 20% of neurosurgeons I would say are probably on the spectrum. AL: Yeah, there you go. You’re right. HR: You know, our friend Temple Grandin says, “Look, Hackie, I speak at commencement graduations all over the country at these engineering schools and I’m going to tell you it’s a big percentage of them are on the spectrum.” In the medical community, I know as an orthopedic surgeon, we didn’t get too many Aspies in orthopedics because they’re a lot smarter than us, so they went into things like neurosurgery and stuff. When I gave the first neurodiversity talks at the American Academy of Orthopedic Surgeons, I said, “Look, you’re already treating them; you just don’t recognize who they are.” That young boy that you thought was so poorly behaved because when you turned on that cast saw he went out of his mind, that wasn’t poor parenting. That’s, maybe you should have used fiberglass instead of, I mean used plaster instead of fiberglass and let them soak it off. Or I should have sent him to Anita Lesko because she knows how to reduce the fractured radius and ulna. What do you think is the biggest single thing that gets overlooked, like say I’m a female, I’m an adult, I just get diagnosed with Asperger’s, what is the biggest advice you would give to that individual? AL: Well, first I’m going to back up a second. I’m going to finish; I didn’t really answer your question before about the medical shows, well, when I watched The Good Doctor, I love how they make Freddy Highmore portray autism, except I think that they need, I wish they had actually more of him in the episodes, as opposed to all the romances going on. I know everybody loves that part, but Freddy, he doesn’t have enough on there on every episode as I’d like to see him on there. They also need to put some real life stuff with what goes on in an operating room with an autistic person being in that operating room. I wish somehow I could contact those folks and share some things with me that I think would make great episodes for them to have, to be picked him in the same scenarios that I’ve actually been in. But now, you asked about the females getting diagnosed. Well, what I see is an incredible problem. 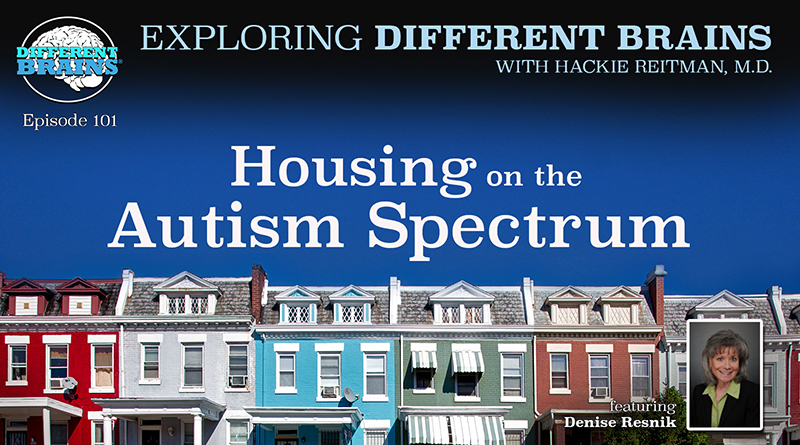 Research and surveys show that healthcare professionals lack the adequate knowledge they need about autism and how to deal with these, this population, how to communicate with this population, to know how to properly treat them and how to interact with them. Well, autistic adults recognize that immediately, and what do they do? They avoid going to healthcare professionals because of the fact that they get marginalized, they actually get, I mean, it’s so negative. Myself, personally, I’ve had one after another negative experiences with doctors and that type of thing, and everyone that I’ve talked to, it’s the same thing. And I even hear parents saying that about their children, doctors that they go to with their maybe a little older children, or teenagers. You get marginalized; some of those doctors look at you and they think you’re lying, you’re delusional about your symptoms and everything. Healthcare professionals need to be educated about. Now I wrote that book that recently came out called The Complete Guide to Autism and Healthcare, and I wrote in such a fashion that it can be used as a textbook for medical students, nursing students, all healthcare professionals, dentists, anybody who has any kind of interaction with patients, that book, because I’m autistic, and use my autism and my medical background of 30+ years, and combine those two together to build that bridge between the autistic community and the medical community, to bring it together so that there will be an understanding, because the people on the spectrum, I just listen to these stories; it’s kind of like deja vu my own experiences. It needs to change, and it needs to change soon because what will happen if you don’t change this and start, this is 2018, it’s like as if doctors didn’t know how to treat diabetes or hypertension and the patients who have that come to them for help, well, they don’t understand, well, you know, then you get people getting disease processes that are getting out of control, well sooner or later it’s going to become a burden on society because then when their disease process gets to the point where they have to be hospitalized or whatever, their medical bills will skyrocket. And the government’s going to have to pick up that for those people. So let’s be preventive and educate people and start from there. It has to start somewhere, soon. With educating healthcare providers. HR: Anita, how can people find out more about you? AL: On my website at anitalesko.com. I’m actually going to be speaking at many conferences with Temple Grandin. Future Horizons, the publisher of my book, has us lined up for various places around the country, so I’ll be jet setting around with Temple, and I have to say, I do very, very different kinds of presentations than a typical presenter, and I kind of put on a show in the beginning, which seems to really entertain the audience, and so I can’t give anything away, but I’ll just say that people are, by the time I make my grand entrance, people are cheering and thinking this is like really exciting. I just eat it all up doing it. It’s just something different and it’s just very entertaining. HR: Now, you had this rare opportunity – I can’t even imagine what it’s like – to address the whole world at the UN conference. Tell us about that. AL: That was a very overwhelming experience. When I got the invitation, I could remember, I’m looking at it like wow, oh wow, oh my gosh, wow. then I remembered the day when it was the actual event. It was March 28, 2017. It was pretty cold in Mannhatten. I think it was 36 degrees and it was a very light rain, because I kept expecting to see snowflakes coming down. And I remember walking up to the building, to the United Nations, and I just stopped and I looked at it, and I was thinking I can’t believe I’m going in that building to talk. You had to go through security just like at an airport, what you went through, with that way, I go through the whole security checkpoint, then I made my way into big, huge room, where you always see events that are televised of the United Nations, and I walked in there and I guess I didn’t think about it, but I wasn’t expecting it, and I’m looking around and I happen to see my name like placard lit up with my name on it right in the front. I took pictures of that because I couldn’t quite believe that. There my name was in the United Nations, all lit up in lights. So after that kind of sunk in, then when it was my turn, it was actually on a panel, and the theme was dating, relationships, and marriage, and Karen Zucker, the ABC journalist, world news correspondent, and she’s the co-author with John Donvan on that book called In a Different Key: The History of Autism, she was the moderator of my panel, and so we all, when it was our turn, we got up, walked across, and sat up on the panel, and I look around the room, and I think there was about four or five thousand people sitting there. I glanced up and I see windows with cameras up there, and I knew it was going to be televised around the world livestream, and I thought, oh well, I’m gonna do what I always do. I talked from my heart. I never prepare anything; I just speak from my heart. And I was the last one that she asked the question to, so I’m sitting there like, oh boy, it’s coming. So I can remember when she turned to me and said, “So, Anita, you seem to be the expert at this, because you’ve accomplished it all. You have a career, you’re married, and all this. What’s the secret? What is your secret?” So I just started off talking about, I think I talked about four and a half minutes, cause it’s on my website; people can hear my actual presentation there at the United Nations. Just seeing all those people that were there and listening to, all these people from around the whole world that were united there and talking about what they’re doing to help people on the autism spectrum, and just the overwhelming feeling that there’s so many people that are working together to make things better for everybody’s life, that was just absolutely overwhelming. HR: Well, congratulations. You’re out there; you’re motivating; you’re inspiring, and you’ve got this book coming out, Temple Grandin: The Stories I Tell My Friends, and your other books and all that you’re doing. Give us some pearls of wisdom now as we close out this episode. AL: My biggest words of wisdom, two things: Don’t focus on the fact that you’re autistic. Forget about it. Think of what you want to do, what you want to accomplish, and use all your focus of energy on achieving your dreams. Just totally forget the autism thing. About that, saying again, I’ll leave everybody with that to remember it, Jon Bon Jovi – “Success is falling nine times and getting up ten.” Never give up. HR: Anita Lesko, thank you so much for being with us here. Thank you. 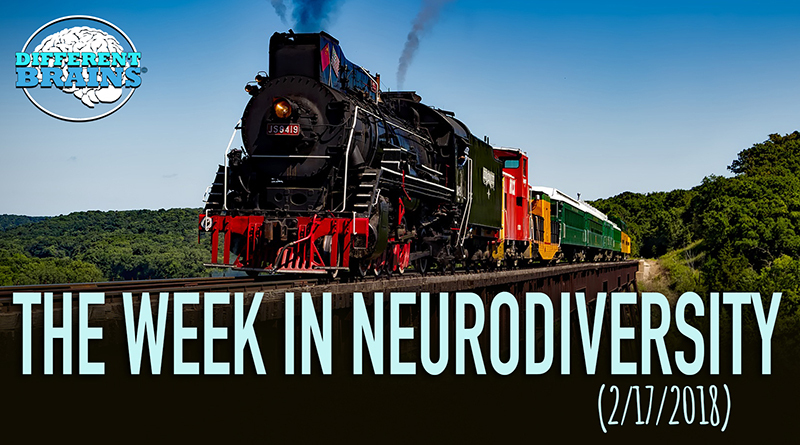 (3 min 21 sec) In this episode, a boy with autism gets to be a train conductor for a day, a toddler out of Georgia will be the first Gerber Baby with Down syndrome, and more! 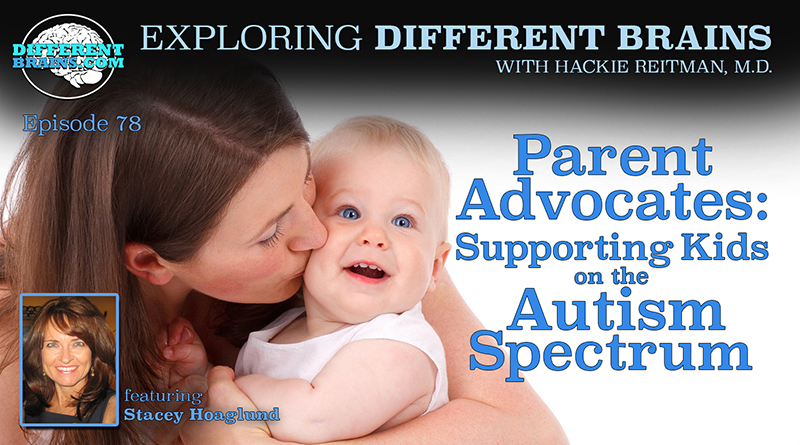 (23 minutes) In this episode, Dr. Hackie Reitman sits down again with Stacey Hoaglund, editor of The Autism Notebook Magazine, a tireless advocate for the neurodiverse, and the mother of a son on the spectrum.